I spotted a wonderful young man in this video—my son Brian Hart Hoffman! He has taken on the role of the Culinary Traveler and finds the most wonderful places to visit for those of us who love great food. This time he is taking us to West Virginia, a great place to visit that offers wonderful places to dine during your travels. Dining has become important in our vacations and getaways. In fact, there are many people who plan travel around restaurants, bakeries, tearooms, and coffee shops. Enjoy this wonderful, short trip through West Virginia. Let’s plan a trip soon! 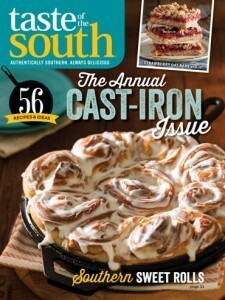 Get all of Brian’s culinary travel tips for West Virginia when you download Taste of the South’s latest issue. Do you have a favorite travel getaway place? Loved Brian’s video of the wonderful places in Charleston. Hope to get their in the future. Can’t wait to see where Brian takes us next! This video was so much fun to watch!! Now I am wanting to make a trip to Charleston. Would make a great trip for a girls group. How fun! Loved the video and now I want to go to Charleston, WV! I look forward to more videos with Brian on the hunt for wonderful southern places! Thank you so much. What a delightful trip to Charleston, WV. Brian did a fantastic job. Looking forward to many more of these trips. Drove through West Virginia one time and it was such a beautiful area. Loved the video on Charleston! Make me want to do a little southern trip. Wow, that was fantastic! Loved the Culinary Traveler! I loved Brian’s tour of Charleston, WV! Please do more of these. It gives us a chance to get a peek at an area we have not had a chance to visit, but love to hear about and am inspired to add to our bucket list. Thanks. I LOVE this! Brian is a true GIFT! I’ve had the honor of calling him my friend for over a decade and I can honestly say he is one of my favorite people, he has the BIGGEST heart, kind, smart, funny and he has a personality that just lights up any room! I enjoy all of Hoffman Media’s publications and I think Brian brings a certain ‘freshness’ to the brand. Bake From Scratch is my newest addiction. What a FUN video of Charleston, WV…makes me want to hop in the car and hit the road! Thanks! I enjoyed Brian’s “travel log” and hope he will do them regularly. How delightful! Brian does a great job presenting Charleston. I hope this will be a regular. I love tea rooms. It would be wonderful to see these including. Thank you so much Phyllis for having your son share this beautiful tribute to Charleston West Virginia, our home State. West Virginia offers so much more and as you featured previously on your blog, home of the beautiful Greenbrier resort. Love your blog and the creative inspiration you share. I used to live in Charleston, WV. I miss it. Thanks to your son for taking me back there with his video! Phyllis, what a delight! I’ve so enjoyed watching your Brian, will this be an ongoing tv show?